Name variations: Keeshan, Keesham, Keeshaw, Kushan. 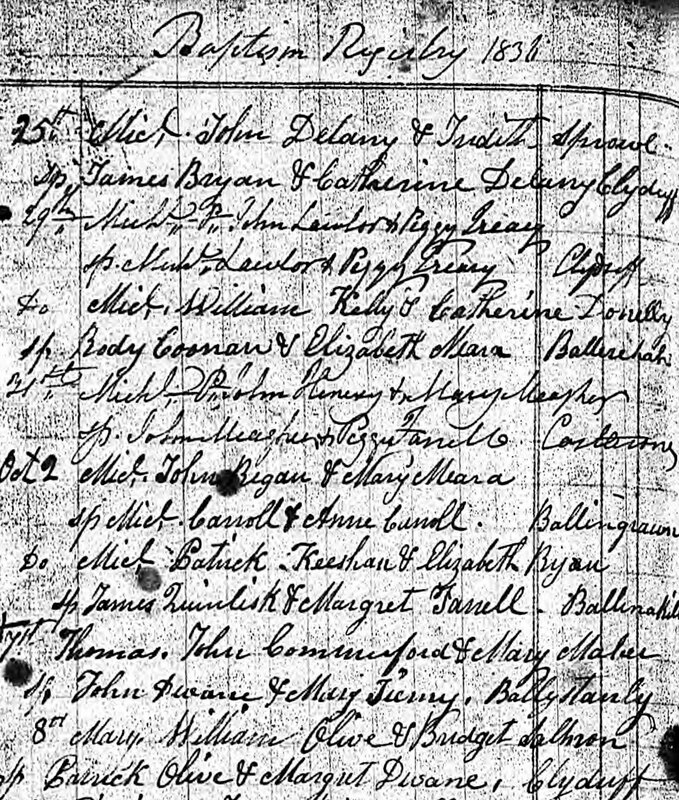 Birth date and place c. 1829 Barna, Moneygall, Kings County (Offaly), Ireland. 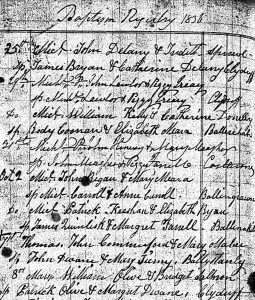 Baptism date and place 2 Oct 1836 Moneygall, Offaly, Ireland. Diocese of Killaloe (tentative). England, Wales & Scotland 49th Regiment Permanent Barracks (East Block), Aldershot, Surrey, England (1861). 2 Greens Yard, Halifax, Yorkshire, England (1871). Physical Description Height: 5 ft. 9 ins. Complexion: fair. Eyes: grey. Hair: brown. Children William Joseph 1859, Manchester, Lancashire, England (no birth record). Elizabeth 1865, Mullingar, Westmeath, Ireland. Michael 1867, Deesa, Bombay, India. Patrick 1869, India (no birth record). Ephraim John 1871, Halifax, Yorkshire, England. James 1876 (d.1877), Perth, Western Australia. 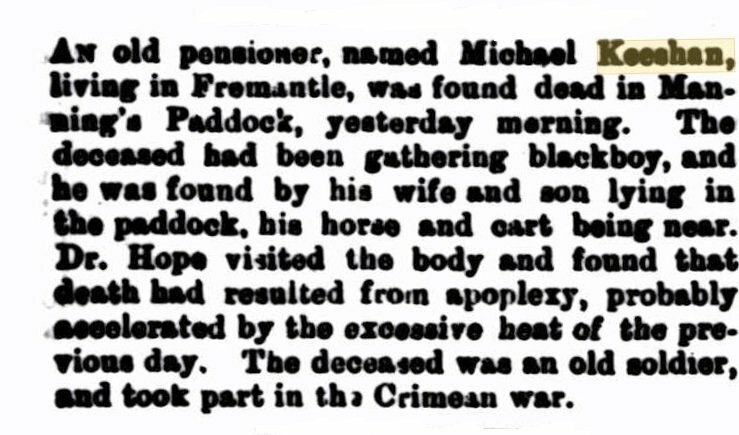 Death date and place 18 Dec 1889 ‘Manning’s Paddock’, Fremantle, Western Australia. Burial date and place December 1889 St Patrick’s Cemetery, Fremantle. 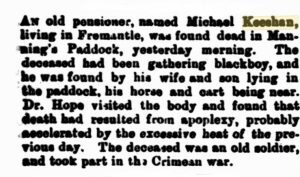 Death Notices and Obituaries West Australian 19 Dec 1889. Western Mail 21 Dec 1889. Regiment No. and Rank #2787 Private. Attestation date and place 9 Dec 1848 Templemore. 8 Oct 1858 Re-engaged at Barbados. Crimea 1 years 10 months. East Indies 4 years 1 month. Casualty/Medical Casualty Roll (as Keesham): Severe wound. 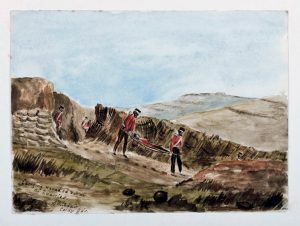 The Assault on the Quarries. 7 June 1855. Wounded in the right leg by the explosion of a mine. Discharge date and place 22 Feb 1870 Colchester. Length of Service 21 years 76 days. Post Discharge Residence Co. Tipperary. Post Discharge Pension District Halifax 1870. Greenwich 1873. Pension Amount 1/- per diem. Increased to 1/2½d. per diem 18 Jan 1881 for service EPF. 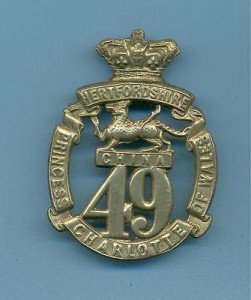 Enrolled Guard 11 Nov 1880 – not on Roll at disbandment in 1887. Misc. Newspaper Articles Inquirer & Commercial News 12 Jan 1876. Click to read of larceny charge. 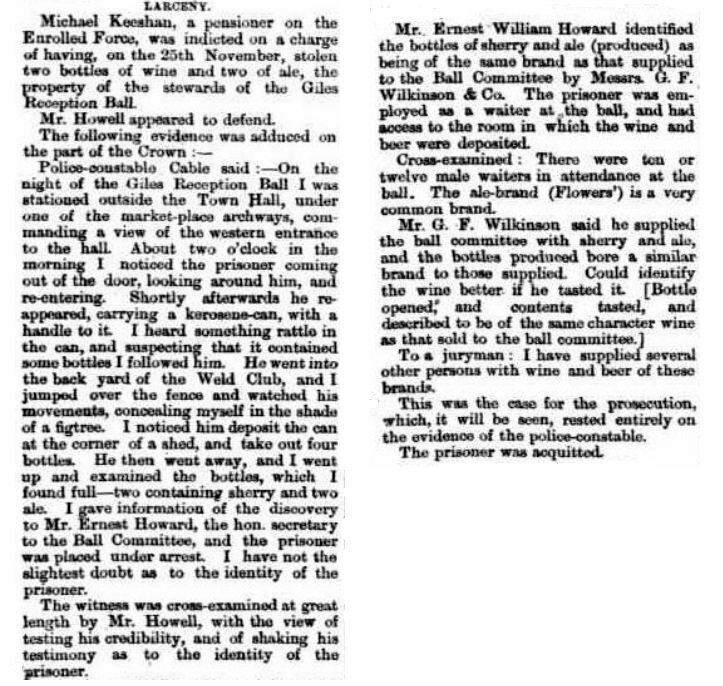 Western Australian Times 7 Jan 1876.